Jul 25 Some girls are just like her. Little Ivy, by Fig and Me. The kind of girl that stays in your head, that you can't fathom letting go. Ivy is like that. 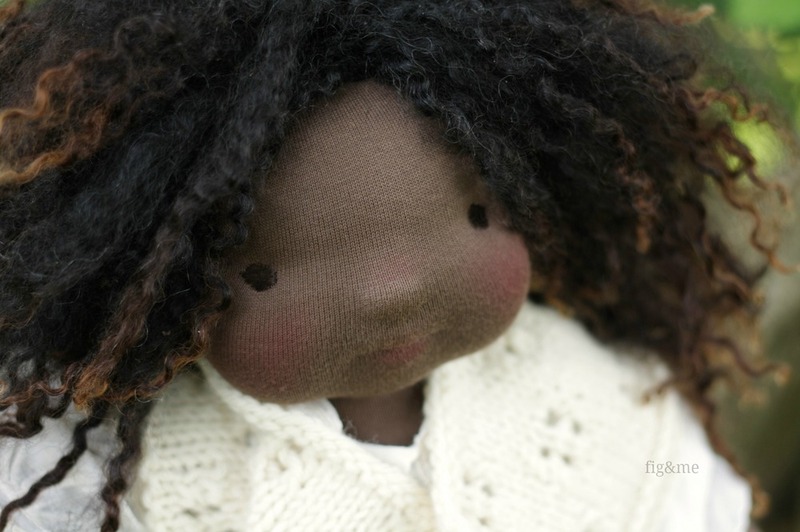 I have dreamed about making a doll with her hair and her skin colour for what seems ages, and I finally grabbed the fibre and turned it into her. And I love the result, and I therefore LOVE Ivy. Wearing white, by Fig and Me. Ivy is full of surprises, by Fig and Me. Soaking some sunshine, by Fig and Me. What I do not love so much about her, is the stubborn streak she was born with. Well, in her defence, I have never worked with that colour of skin fabric and I made a very poor choice when knitting her silk shawl. The pink I selected, which would have looked beautiful on any other doll, just did her no justice. I can't allow that, Ivy needed something that would make her face shine with the radiance she carries inside her eyes, so I knit her a lacy cowl. It's a bit big but she likes it, and I saw her wear it on her head too. She is silly like that. We borrowed our favourite antique batiste dress and took her out for a quick photo shoot. Ivy in the summer, by Fig and Me. Sitting on a rackety fence, by Fig and Me. My name is Ivy and I am precious! by Fig and Me. So since life threw me a curve ball, and I had to scratch the attire in mind, I am now sewing new clothes for her. No matter, they look so much better on her anyways. Ivy is a 20" tall figlette and she will be sold via auction on Sunday July 27th. Details to come. I will post quick snap shots of her over the weekend on facebook, if you want to drop by and have a little visit. Off to make her boots!. May 13 Little Enid, and her love of roses.